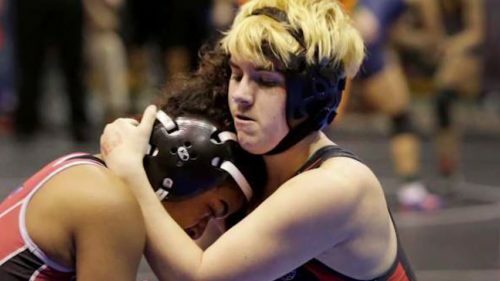 Transgender high school wrestler Mack Beggs will, starting tomorrow, try to defend his Texas state title, and again he is being forced to compete against girls. Beggs has once again gone undefeated while being forced to wrestle against girls, due to Texas public high schools rules requiring athletes to compete under the gender on their birth certificate. He has gone 32-0 this year, and went 56-0 last year. His season last year was marked by controversy, with many arguing that he could hurt his female competitors, as he was taking testosterone and steroids, as he still does. His mother, Angela McNew, said they are strong enough to stop the menstrual cycle but not build muscle. Lawmakers in the state are considering a bill that would regularly test student athletes for steroids. It has stalled in the House, after passing the Senate. The House won’t reconvene until after Beggs has graduated. A lawsuit attempting to prevent him from competing was also dismissed. While state law bans the use of steroids by student athletes, it stopped testing for it after 2015. His use of testosterone is allowed under a “safe harbor” exception for athletes taking performance-enhancers for medical purposes under a doctor’s guidance. This season has been quieter for Beggs, who is avoiding media to concentrate on his wrestling, but the situation hasn’t changed. The University Interscholastic League, the governing body for Texas high school sports, put the birth certificate rule into place in 2016. Jamie Harrison, the UIL’s deputy director, defended the decision. “The UIL is not in the gender-determining business and schools don’t want to be either,” he said. He added that while the UIL is willing to consider making exceptions to competition rules if asked, it did not receive a request from either the Beggs family nor his school to allow him to wrestle boys. He said it would not be appropriate for the group to have initiated that process. McNew, for her part, said they didn’t ask because the rule was clear that Beggs would be forced to wrestle against girls due to the birth certificate rule. Beggs has been on the receiving end of a number of disturbing comments, especially after his story began to make national headlines. He plans to carry that positive attitude with him into his college career. He is reportedly considering a college scholarship. He would be able to wrestle in the men’s division in college if he should so desire. The NCAA, as well as USA Wrestling and the U.S. Anti-Doping Agency all already classify him as male due to his testosterone treatments.